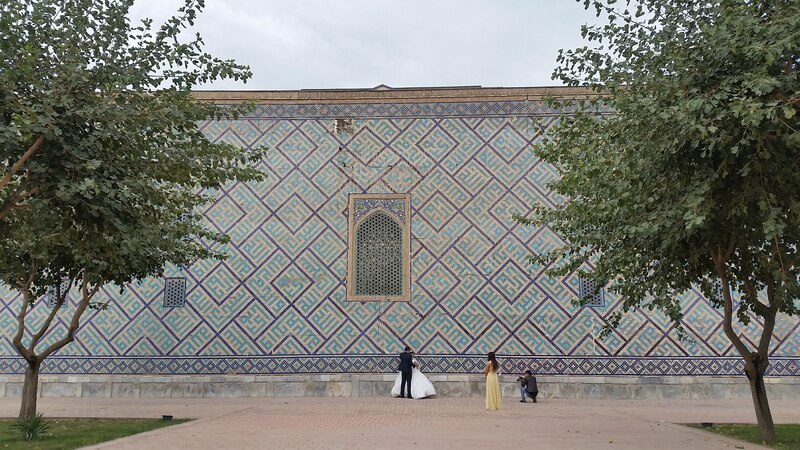 After a summer of fun, family, friends and weddings back in the UK we continue our trip from Samarkand. Our flight from London Gatwick went via Istanbul, where we switched from Turkish Airlines to Uzbekistan Air. We’d had to pay £80 per bike in London and then got told in order to board our second plane we had to pay for our bikes again. This seemed outrageous consudering the amount already paid and the minimal excess we had, a small bag weighing 16kg. After kicking up quite a fuss and nearly missing our flight they let us on, still no idea whether the extra charge was official or not! 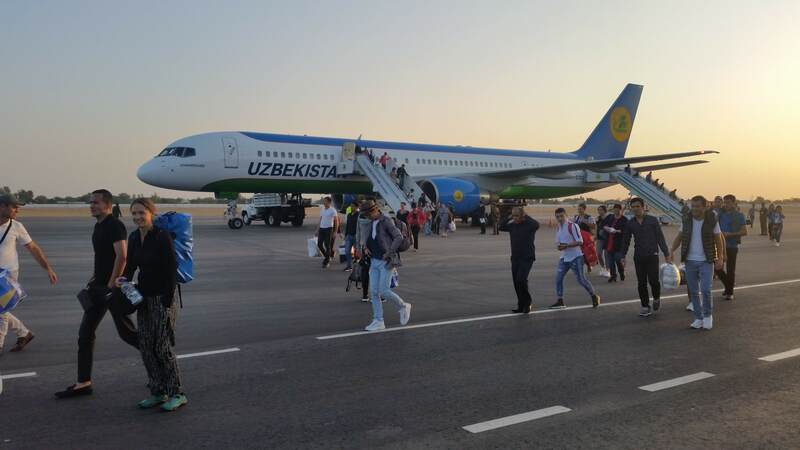 I was a bit nervous about passing the Uzbekistan customs as they have tight restrictions on pharmaceuticals and other items of high value, but we got waved right past the scanners and out into the morning sun. Samarkand airport is small and quiet, no-one bothered us outside as we slowly built our bikes up and rode the short distance to our hostel in the city. 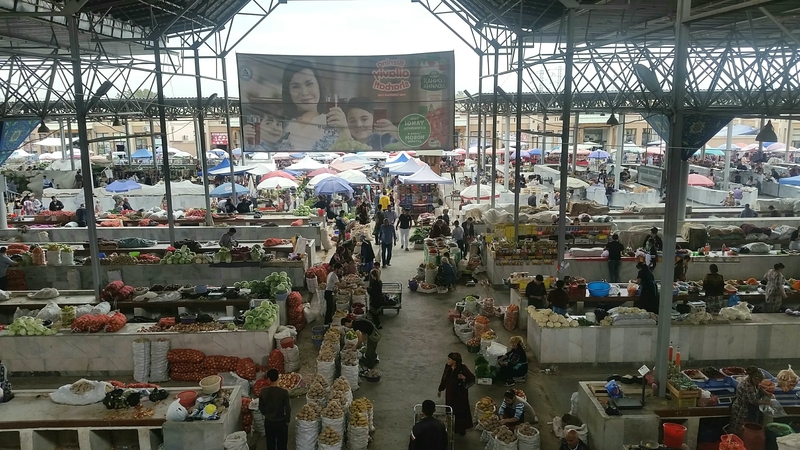 We were given a taste of the infamous Central Asian hospitality on our first evening when after doing a supermarket shop and realising they dont take cards, Jules went to find the nearest bank. An hour later he came back empty handed, but the supermarket owner not only told us to take our shopping and pay him tomorrow, but also gave us tea in his cafe next door. Sadly, I just can’t imagine the same thing happening back home. 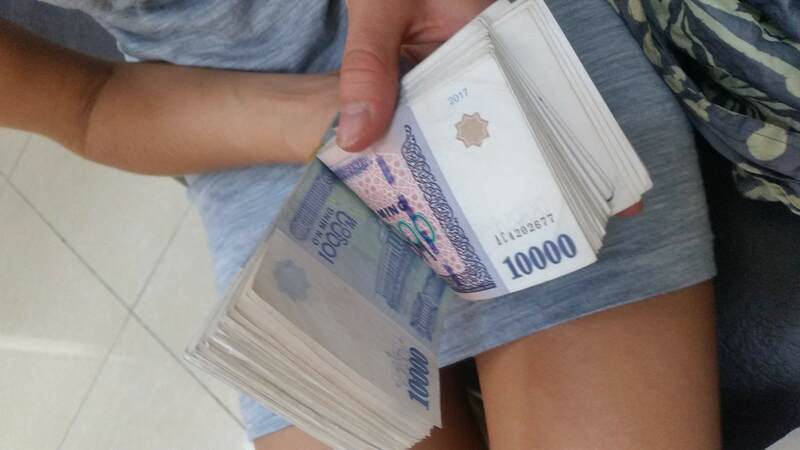 Finally after the ninth bank we tried, we could withdraw Uzbekistan Som where £1 = 10,000 Som, so we went from being peniless to being millionaires overnight! Lucky we are traveling now, a few years ago 5,000 (50p) was the highest bank note issued. It was bad enough counting out the noney for our supermarket shop in 10,000’s until we realised each till had it’s own high speed money counter! 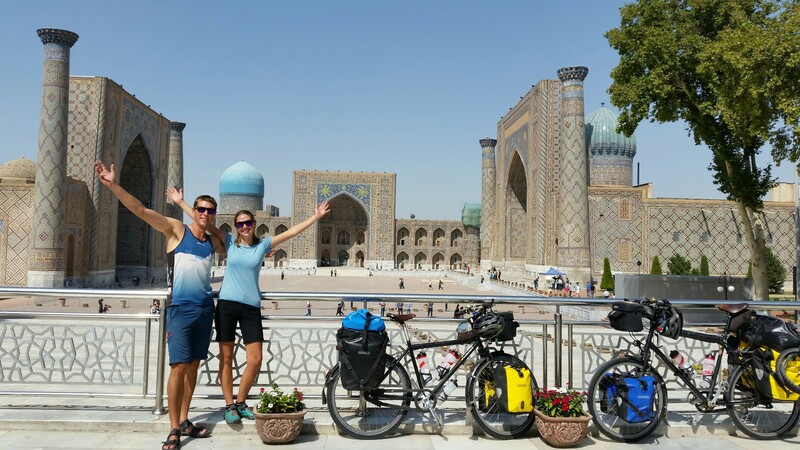 We spent a few days walking around Samarkand and catching up with other cyclists. The city is easy to walk around and has some quiet pedestrianised parks which break up the busy streets. 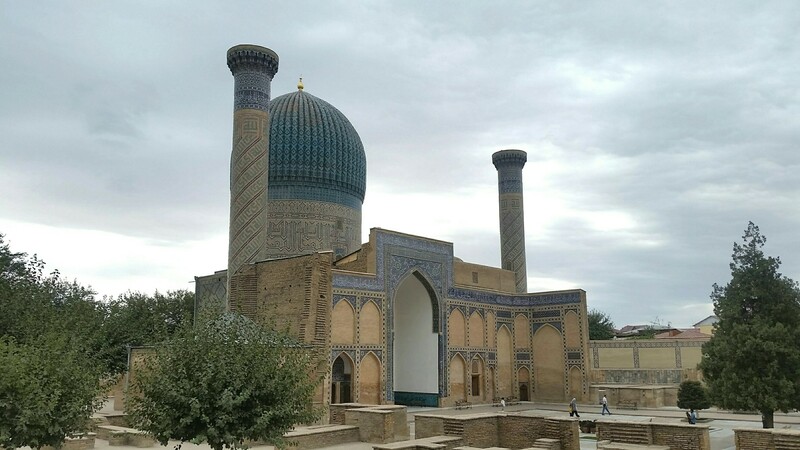 We explored the 15th century Registan and Mausoleum built during the Timurid dynasty. 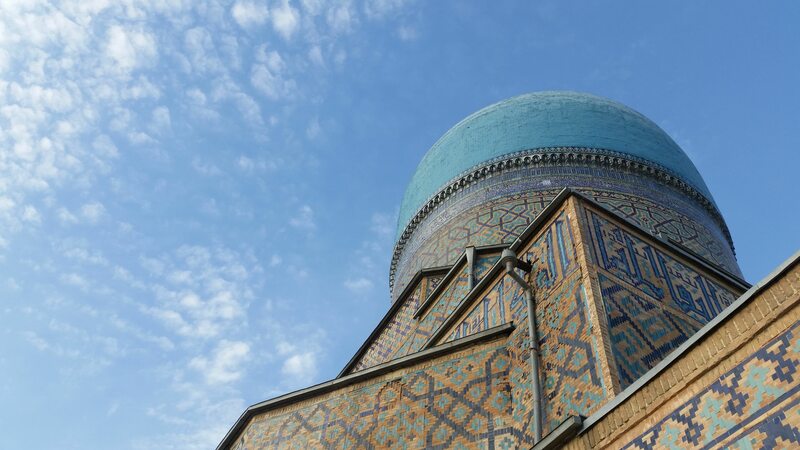 The Registan is flanked by three large madrasahs which are beautifully decorated with small colourful tiles and Persian script. The colours change with the rising and setting sun, and again when lit up at night - provided the city has enough electricity! Another highlight was the Samarkand bazaar. 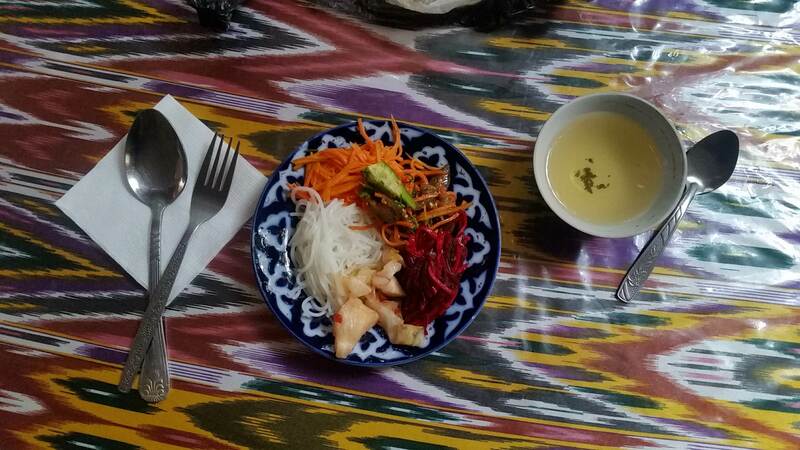 It has an impressive selection of Persian sweet treats, spices, dried fruit and nuts and fresh kimchi and pickled korean salads. 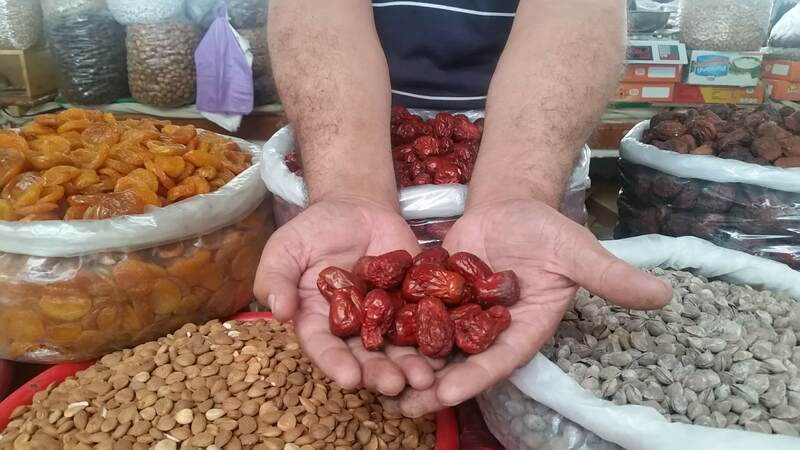 We learnt all sorts from the dried fruit seller, apparently uzbek dates (pictured below) not only aid digestion but also act better than penicillin, and dried melon beats viagra any day!!! Day 4 and we were ready to hit the road again. It’s a fairly busy 40km ride to the border but straight, flat, and with good road surface so no complaints. 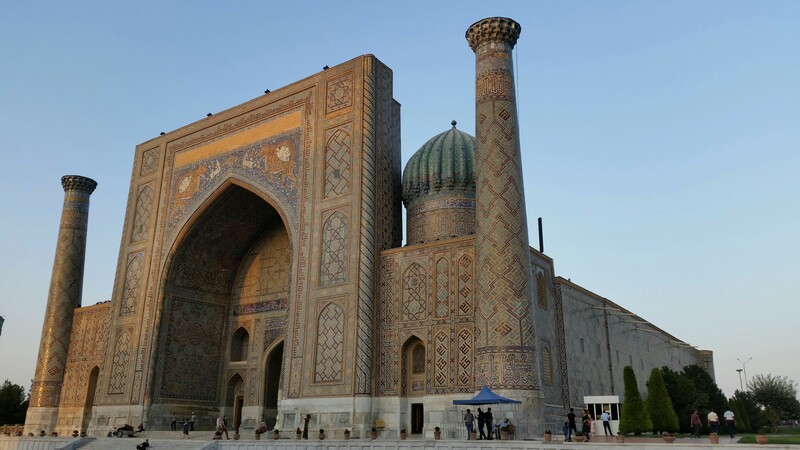 It’s been a short and sweet stay in Uzbekistan, a fascinating place and one that may have to be re-visited to explore more one day.